Gigantic always has the tickets you need. Let’s have a look at what goes on sale this week. 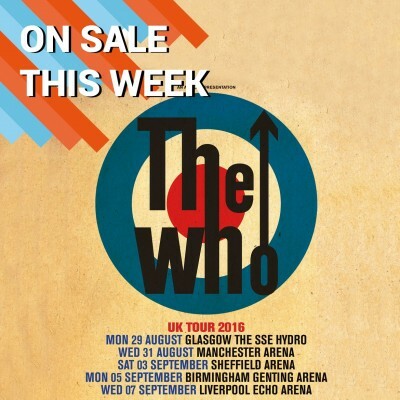 Having celebrated their 50th Anniversary in style, The Who are about to embark on their Back To The Who 51! Tour. There is no substitute for the real thing so make sure you are there when they play their stunning arena tour. This summer sees the titans of rock AC/DC play the UK. Make sure you get tickets to their high voltage concerts on sale now. There’s no need to go down a highway to hell to get them, just use our site! Click here for your AC/DC tickets. For those of you who live to Eat, Sleep, Rave, Repeat - Fatboy Slim will be taking over Times Square in Newcastle. It’s sure to be a wonderful night that will see you dancing away to massive hits like Gangster Trippin, Right Here, Right Now and Praise You. Click HERE for your Fatboy Slim tickets. We have some great tickets just about to go on sale. Check out cult indie rockers Augustines who are touring in October. Jack & Amanda Palmer sees the cabaret influenced performer from The Dresden Dolls team up with her father. Superheroes 3 Doors Down return to the UK in November and David Cross will have you laughing out loud with his fantastic comedy. Having barely let the dust settle from last weekend’s amazing festival, Handmade 2017 have just placed their early bird tickets on sale. This year’s headliners included We Are Scientists, Deaf Havana and Swim Deep. Next year will be even bigger! Other amazing tickets on sale include Digitalism, Echo & The Bunnymen, Meilyr Jones, Agnes Obel, Collie Buddz and the mighty Calum Scott. All the best tickets brought to you by Gigantic!